For the first time in eleven years, Martina McBride held residence at the South Shore Music Circus, an in-the-round concert tent complete with a rotating stage, for two shows Aug 6-7. Judging by the sold out crowd, the fans were as happy to see McBride as she was to be back in Cohasset, Ma. This show marked my annual trip back to the venue (a mere fifteen minutes from my house), and my first time seeing her from front-row seats. During the set she ran through most of her beloved hits. Sitting so close to the stage, I was privy to her set list, so I knew what she was going to sing before she walked on stage. Neither good nor bad, it took away that element of surprise I often look forward to at a concert. It kind of ruins it for me to know what’s going to be sung in advance, but it didn’t dampen my appreciation for the night. She opened with a brand-new song, “One Night” which will appear on her upcoming album Eleven. An up-tempo tune, it continued down the path set by “Teenage Daughters” of showing off a fun more relaxed side of the singer. Without skipping a beat she ran through other up-tempo hits including “My Baby Loves Me,” “Wild Angles,” and “When God-Fearin’ Women Get the Blues.” It was nice to see her spanning her whole career and not just her hits post-millennium. The night’s first ballad was the recently-debated “I’m Gonna Love You Through It,” a story about a woman battling cancer. I was most anticipating this song because I wanted to hear for myself if it really was as prodding and lifetime movie-esque as people have made it out to be. Hearing her talk about she knew she had to record the song the moment she heard it, put it in a new light for me. It’ll never be among my favorite of her singles, but it isn’t as god-awful as everyone makes it out to be. As always, she gave it a very passionate performance. For the remainder of the evening she mixed her biggest hits with well-chosen covers. What struck me about the set was the balance of up-tempos and power ballads. I really enjoyed how she didn’t lean too heavy on one area of her catalog but covered all her bases. Of course, though, it was the ballads that got the strongest reaction from the crowd. She received long standing ovations after performing “Anyway,” “Where Would You Be,” and “A Broken Wing,” which she sang with all the gusto in her body. I enjoyed how she would give the crowd time to applaud before signaling to her band to launch into the next song. Being so close to the stage, you’re able to see, and appreciate, all the little nuances of the performance. But the highlight of her set was her cover of Kris Kirstofferson’s “Help Me Make It Through The Night.” She quieted down the arrangement and let the steel guitar player do his magic. As with her studio recording from Timeless, she uses this song as an exercise in restraint, rarely singing above a whisper. I loved hearing how simple the song came off. In giving the song room to breathe, she let the quiet moments shine through. The other cover, Bill Wither’s 70s classic “Lean On Me” was well-sung and had the crowd singing along, but seemed an odd choice. I loved her take on the song and enjoyed the opening bluesy steel riff. Her steel guitar player seemed to play on and on for well over a minute and a half, whipping the audience into a tizzy. I love how McBride relinquished the opening verse of the song to her younger brother who’s the lead guitar player in her band. It added another dimension to the night. Of all the songs, “Lean On Me” was easily the one sung along to the most. Everyone knows it from either hearing it on the radio or from their childhoods. I loved she chose to cover the tune, but wondered, if she hadn’t, which of her own hits she would’ve sung instead. The biggest surprise of the night was the medley of “Love’s The Only House” and “Blessed.” In a reflective sense, those two songs go together really well. You have the social commentary of “House” mixed with the I’m doing alright nature of “Blessed.” Almost like, there’s a lot of downtrodden people in the world but my life is pretty well on track. McBride nicely opened the medley by playing the harmonica bit herself. Following “House/Blessed” she went on to close the show with “This One’s For The Girls” and “Independence Day.” She sang “Over The Rainbow” as the encore, a cover I’d first heard her sing at the same venue eleven years earlier. It really is true, you can never grow tired of hearing that one. In the end, it was an excellent show that brought up my appreciation of McBride and her music. I’ve been thinking a lot about her since and am really looking forward to the new album in October. I only wish the acoustics weren’t so loud, but it didn’t dampen my experience in the least. 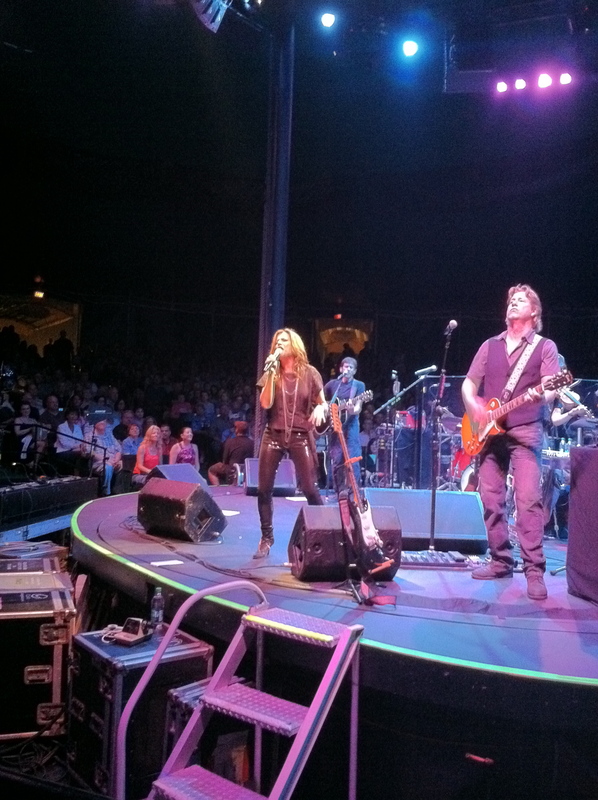 Following the show, McBride sent out this Tweet: “Tonite’s show in Cohasset was amazing!U guys rocked! Loved it! Now on the bus.Have John and all 3 girls w/me. #3dayvacationofficiallystarted.” I LOVE modern technology! The biggest surprise of the night was the opening act, Blaine Larsen. Discovered by Joey + Rory’s Rory Lee Feek when he was just a young teenager, he’s 25 now, Larsen used just a guitar and a stool to come off extremely likable, and inject more personality into his performance than any other opening act I’ve seen in recent memory. And while his style is very similar to that of Chris Young, Scotty McCreery, and any other deep voiced male country singer, he was able to distinguish himself from that pack with his mix of both serious and playful songs. 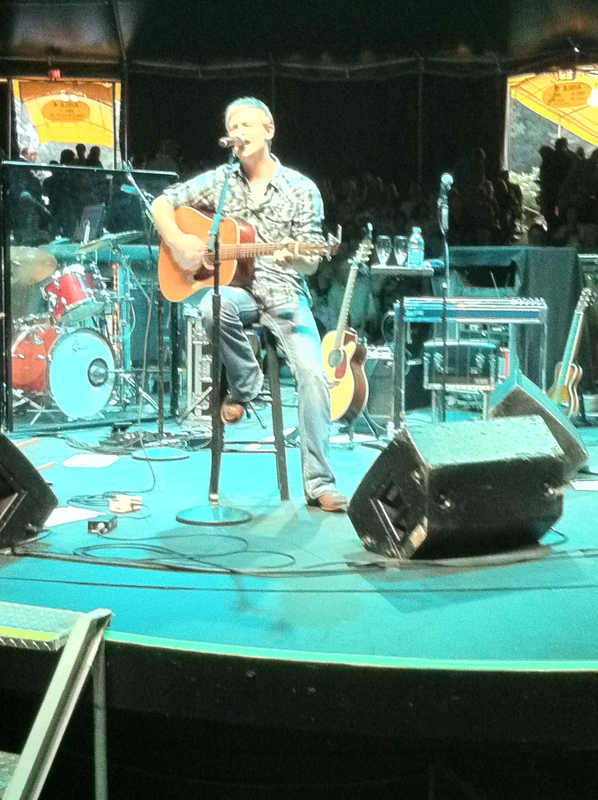 He ran through a few of his singles including “I Don’t Know What She Said” and “Chillin.” He left not a dry eye in the room with his only top 20 hit “How Do You Get That Lonely,” and played the “songwriter’s version” of George Strait’s “I Gotta Get To You” which he co-wrote with Jim Lauderdale and Jimmy Richie. But it was his excellent cover of Merle Haggard’s “That’s The Way Love Goes” that proved his talent. Anyone who can come up to snuff with a Haggard cover, is worth a lot in my book. And even though I’m not to familiar with it, I would’ve liked him to sing his debut single, “Back In My High School,” only because it was the song that first got the attention of the industry and allowed “Lonely” to go top 20. But nonetheless, he should be a big star, but given that there’s much competition from others who sing just like him, and the fact he didn’t have American Idol or Nashville Star to gain exposure, that seems unlikely. But that doesn’t diminish his talent. Hits not withstanding, and if his songwriting career keeps picking up, Larsen proved in one 30 minute set, that he really is going places.